FQB "Everlasting" Collection is a magnificent wedding digital kit that contains everything that you need to create with from the proposal right through the ceremony and reception! Created with a wedding album or mini album in mind, it encompasses all of the accoutrements to design a complete album of this special event. 4 Corner clusters each differently arranged, but equally as gorgeous! 1 Event cluster - "With this Ring"
1 Event cluster - "Bridal Shower" that could make a terrific stand alone invitation! 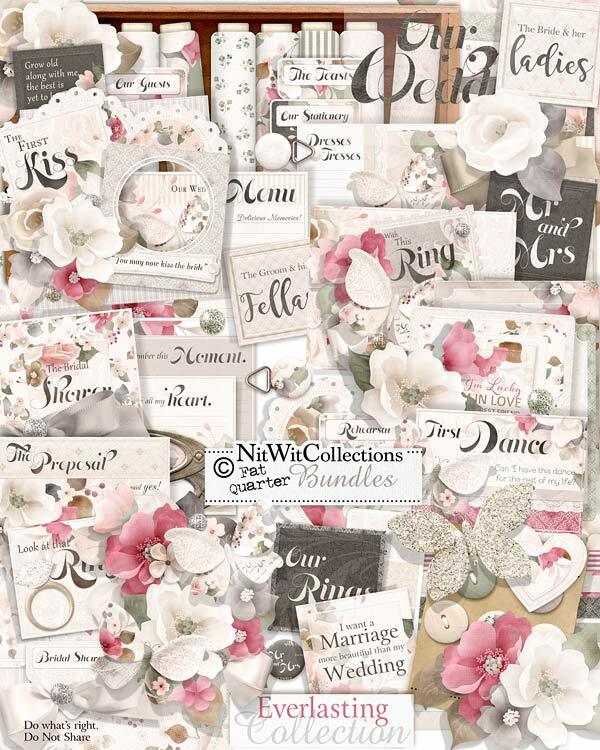 1 Event cluster - "First Dance"
1 Event label - "Our Rings"
1 Event label - "Look at that Ring"
2 Photo frames with sentiments attached....just add your perfect photo! 3 Mats that are such useful digital elements to begin your creating with! Add further embellishment, photos, handwritten sentiments or so much more...begin your inspiration here! 2 Nameplates that you could use to add in dates, names, etc. 1 Sentiment square - "Mr. & Mrs."
1 Sentiment square - "The Bride & her Ladies"
1 Sentiment square - "The Groom & his Fellas"
1 Sentiment square - "I'm Lucky I'm in Love...."
1 Sentiment square - "I want a Marriage..."
1 Sentiment square - "Grow old along with me...."
1 Title digital element that clusters together so many of the digital elements of this kit with a wordstrip inscribed with "Our Wedding"
1 Wordstrip - "Just Married"